Who doesn’t want to have an ideal body? Almost everyone want to have an ideal body weight and stay healthy but our lifestyle most of the time, making it hard to achieve our goals. People have been doing many effort to lose weight such as with dieting and consuming some Oils like Grapeseed Oil vs Safflower Oil. Both of them are natural but the effectiveness is still questionable. If you also interested in these oils, go check our article below. A healthy body and healthy mind is a key to achieve happiness in live and many people are struggling to get to the point. It is understandable because our daily life have led to unhealthy body and each day we try to change it, the harder it gets. Dieting is one of the most common example because when you limit the food and drink you can consume our body will experience some drawback and make it even harder to continue the plan let alone finishing it. Dieting has been proven to improve health and a suitable diet may differ from one to another person because we have different body and lifestyle. A healthy lifestyle is worth to achieve if we want to have a healthy body and don’t forget about the exercising part because just like dieting, it is hard as well for many people including us. A healthy diet combined with regular exercise will help us lose weight, increase muscle mass and overall achieve a fitter body. If you are not a fan of doing strict diet, you may want to try changing the lifestyle instead by consuming healthier, home cooked foods and limit the intake of high carbohydrate food or drink like sugar. Besides carbs, fat is another thing that many people avoid when dieting but of course not all fat are bad because there are fat that rich of Omega 3 which is good for your health. Instead of using cooking oil, it is better to move into the healthier oils like Grapeseed oil and Safflower oil. 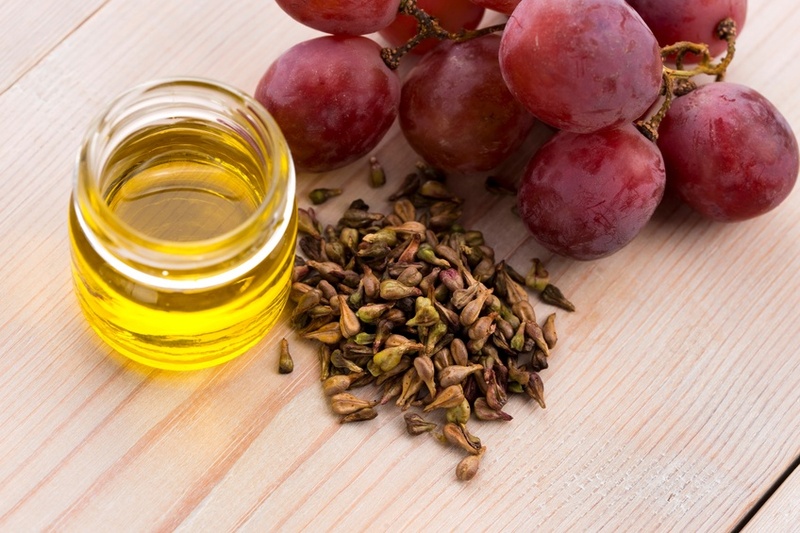 We are sure many of you already ever heard of Grapeseed oil and if you wonder how this oil is made, just like the name, it is derived from the seed of grape fruit and just like many other healthy oils, this one get so many attention in recent years. This is because it can be a substitute for your cooking oil and due to the lack of taste, it won’t affect the food you are cooking with it while for manufacturers, this is brilliant finding. Grapeseed has been the useless byproduct of wine makers for so many years and people used to just throw it because they don’t know the economic value of those seeds yet. After the discovery of grapeseed oil, people no longer throw the byproduct and use them to produce the popular oil that is better than vegetable oils, healthier and bring some benefits to our body if consumed in a limited amount. Thanks to the advanced in technologies, you can find it in many stores in present day. Grapeseed oil is usually extracted in factories and to make the oils, they use solvents on the process while if you want to find the healthier type, choose the oils that are made with cold-press method or expeller pressed. The drawback of the regular method is there are toxic solvents like hexane even though the traces in oils is still unknown whether it can affect our body or not. However, just to be safe you may want to pick the healthier option though it can be more expensive than the regular version. Many people use Grapeseed to replace the vegetable oil and if you think it is rich in nutrients, then you may want to rethink the option because this oil is low in nutrients but just like many other oils, it is rich is Omega-6 fatty acids. Since it is high in Omega-6, it also have a high amount of Linoleic Acid which when consumed by human or animal, it will become gamma-linoleic acid or the popular name called it just as GLA. This GLA is proven to have protective roles in the body and might lower cholesterol levels as well as inflammation in some cases, moreover, when converted into another molecule called as DGLA. Taken from DR. Axe, is better when compared to other oils like sunflower oil because it is able to perform better for lowering inflammation and insulin resistance in female with obesity or overweight. Linoleic acid itself is an essential fat which we can’t made on our own and we must get it from foods. Just like Sunflower oil, Grapeseed oil is a good source of vitamin E because it has a high amount even when compared to Olive oil and just like what you may already know, this vitamin is beneficial to help our immune system to fight free radicals and help preventing cells damage. As for dieting, we are not supported to drink Grapeseed oil but you can if you want. This oil is more popular of being the substitute of vegetable oils because compared to our common cooking oil, it has a high smoke point so it will not smoke even when in hot temperature. The tasteless oil also won’t affect the cooking, so you can use it for either deep frying or for salad dressing. What you have to keep in mind is unless you don’t do high amount of physical activity, we shouldn’t consume oil exceeding 7 teaspoon per day, moreover, just like any other oil, Grapeseed oil have an oily textured which is not pleasant to drink. 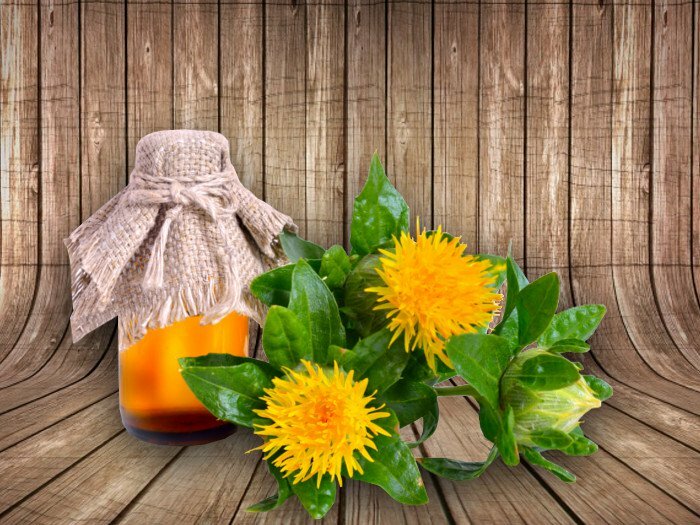 Another oil that have the same amount of nutrition and similarly popular for those who want to try changing their lifestyle or diet is Safflower oil. This oil is equally popular for weight loss due to the CLA derived from the fat you can find on the oil which is actually not exclusive to it since it can be made from various other oils as well. Just like the name, this oil is made from the seed of safflower plant and beneficial for both diet and skin. Read also: Safflower Oil vs Sunflower Oil here. When talking about Safflower oil, the one that first come to mind must be the CLA. This substance is very similar to the GLA we have mentioned above that you can find in Grapeseed oil. CLA is a type of polyunsaturated fatty acid which you can found in many diet supplement because this can help you lose weight and get that ideal body you have been working on. You can get this from certain food as well but different from the commercially made CLA, it is lesser in trans-fat. Another benefit of Safflower oil is it may help you maintain that blood cholesterol level because it is rich in unsaturated fat. It will help as an anti-inflammatory due to the unsaturated fatty acids and in the end, it will help several condition as well including diabetes and heart disease. When not consumed, the oils is good to treat dry skin because just like many oils, it has a high amount of vitamin E that not only protect your skin from free radicals, it will hydrate the skin altogether. The main reason why people are consuming Safflower oil or Safflower oil supplement is because of the CLA we mentioned above. However, this oil is actually not a good source of the substance because in each gram of the oil, it only have minuscule .7 mg of CLA. Another issue when consuming the oil in a high amount is because of the high Omega-6 which is essential but not good when consumed excessively because it can bring harm like increase in obesity. Thus, consuming high Safflower oil is not effective as a weight loss supplement and even may threat to increase your weight. One of the safest way to consume the oil to help you improve your health is by making it as a cooking oil because monounsaturated Safflower oil is safe to cook even in high temperature, making it suitable for deep frying and baking while the rather tasteless won’t affect the food you are cooking. On the other side polyunsaturated Safflower oil is better when not heated. 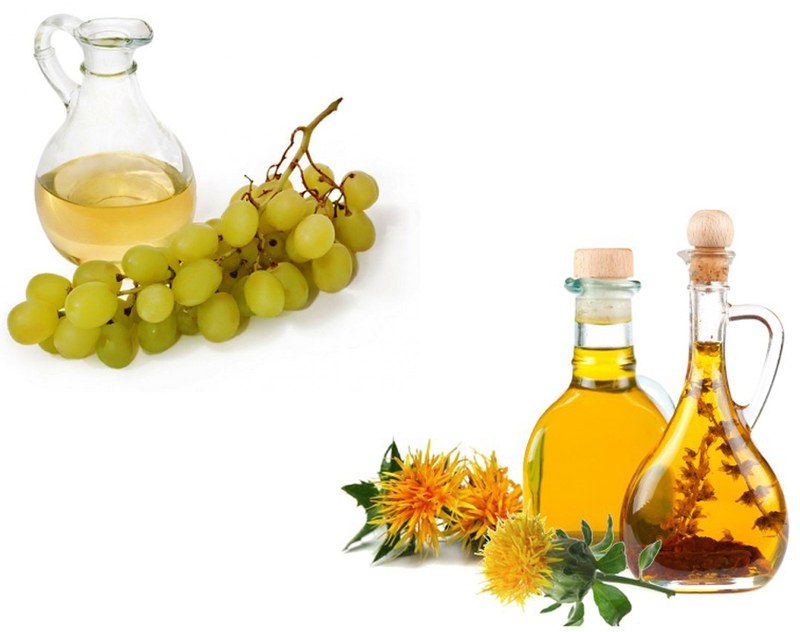 Now, let’s compare Grapeseed oil with Safflower oil. As you may already know, the prominent difference between them is because Grapeseed oil will turn into GLA while Safflower oil have CLA. Both of them have a similar benefit yet are also different because GLA will help you burn fat by increasing the metabolism. At the other hand, CLA is good at burning visceral fat, those in between your muscles and organs and especially helpful to deal with belly fat. Additionally, GLA will maintain the skin and CLA help gain muscle as well. All in all, both of them are a good substitute for regular vegetable oils. They may help you increase your health but as for weight loss, consuming them by drinking is not recommended for the high Omega-6 may increase some health risks as well.